I really enjoyed my time at El Poeta. 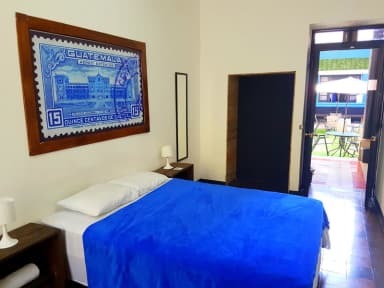 The hostel is perfectly located in Zone 1 and the prices are really affordable. Staff was very helpful and friendly, 24 hours reception, hot showers, big dorms and beds and the breakfast is included! Great place. Super clean and cool owners! 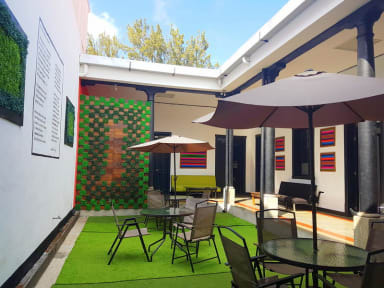 Das Hostel mit dem besten Preis-Leistungs-Verhältnis auf unserer Guatemala Reise! Großes Zimmer, alles sauber, Wärme Dusche, sehr hilfsbereite Mitarbeiter, und Frühstück inklusive! Super! Es war sauber, der Innenhof war gemütlich, die Bäder waren sauber, die Betten waren auch ok, der Besitzer war sehr freundlich und hilfsbereit, würde wieder kommen. The staff was very friendly,the showers were the hottest ones I have found so far since we left home. Our dorm was at the side of the building facing the street (a little loud if you are a light sleeper),but there were other dorms as well. The only downsides were the atmosphere (it seemed to me as if it was more of a transit place) and the not so fresh air in the dorms (couldn't open the window facing the street). Definitely go to the little steak restaurant just around the corner!! Good hostel to stay at for arrival of leaving day of trip. Super clean, amazing breakfast, but not a lot of people and not a big atmosphere when I was there. Perfect for the price you pay. Good Hostel. Nice breakfast, hot showers, very central, dorm room is next to the street. At night it's quiet, but early in the morning starts traffic. Hot showers, good internet, kitchen with oven. Recommendable! Ich bin von drei gebuchten Nächten nur eine Nacht geblieben. Vorallem weil Guatemala City echt nichts ist für einen längeren Aufenthalt. RÄUME: Die unteren Betten der hochbetten in den Dorms sind ein Traum, da bequem und ~1,4m breit. Wo hat man schon mal sowas in einem Hostel? FRÜHSTÜCK: vier Sorten von Obst, Kaffee, Milch, Haferflocken, Pancakes. Mitarbeiter sprechen eigentlic nur spanisch. Negativ: Grundausstattung Erste Hilfe Kasten fehlt. Verletzte mich und man konnte mir nicht helfen.